The Markets. Rates eased a bit in the last week, but the numbers did not reflect the full effects of the announcement released after the meeting of the Federal Reserve Open Market Committee chaired by Janet Yellen. Freddie Mac announced that for the week ending March 20, 30-year fixed rates decreased to 4.32% from 4.37% the week before. The average for 15-year loans fell to 3.32%. Adjustable rates were mixed last week with the average for one-year adjustables rising slightly to 2.49% and five-year adjustables falling to 3.02%. A year ago 30-year fixed rates were at 3.54%. Attributed to Frank Nothaft, vice president and chief economist, Freddie Mac –“Rates on home loans eased this week as housing starts declined 0.2 percent in February to a seasonally adjusted annual rate of 907,000, below consensus forecast. The rate on the 10-year Treasury note rose following the Fed’s announcement Wednesday afternoon and, if this holds, interest rates may begin to trend higher going into next week.” Rates indicated do not include fees and points and are provided for evidence of trends only. They should not be used for comparison purposes. When it comes to combining dwelling units, two really are better than one. But expect higher fees and more paperwork. Co-op prices experienced significant year-over-year gains of 32% in average price and 34% in price per square foot. Condo prices saw more modest gains of 5% and 19%, respectively. Number of contracts signed dropped 19% in condos and 17% in co-ops. This can be attributed to strong sales in February 2013, lack of available supply and uncharacteristically cold and snowy winter. Days on market decreased by double digits in both categories. Average days on market dropped to 109 days for condos and 91 days for co-ops. Average sale price increased 15% year-over-year, continuing a trend of twelve consecutive months of growth. In February, buyers paid an average of 1.1% over last asking price with 55% of contracts signing above asking price and 13% signed at asking price. Average days on market decreased by 18% year-over-year. There were also 24% fewer new listings compared to last month and 61% less than February 2013. The Markets. Last week, rates bounced back in the aftermath of the release of the employment report. Freddie Mac announced that for the week ending March 13, 30-year fixed rates increased to 4.37% from 4.28% the week before. The average for 15-year loans rose to 3.38%. Adjustable rates were mixed last week with the average for one-year adjustables falling to 2.48% and five-year adjustables rising to 3.09%. A year ago 30-year fixed rates were at 3.63%. Attributed to Frank Nothaft, vice president and chief economist, Freddie Mac –“Rates on home loans edged up amid a week of light economic reports. Of the few releases, the economy added 175,000 jobs in February, which was above the market consensus forecast and followed an upward revision of 25,000 jobs for the prior two months. Meanwhile, the unemployment rate nudged up to 6.7 percent, the first rate increase in over a year.” Rates indicated do not include fees and points and are provided for evidence of trends only. They should not be used for comparison purposes. Contact me to discuss any upcoming vacancies and pricing of your units. Landlord concessions remain popular as the vacancy rate falls and rents rise slightly. 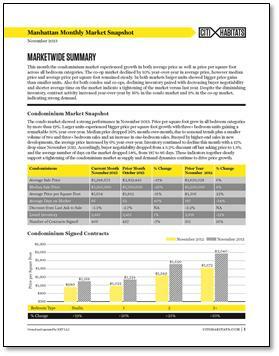 New York, NY (March 13, 2014) – Leading Manhattan real estate brokerage Citi Habitats released its monthly rental market report for February 2014 today. The results show slightly more favorable conditions for landlords when compared to the month prior. However, the percentage of transactions that include a move-in incentive remained relatively high, which is good news for would-be tenants. The report found that average rents increased slightly for all apartment categories except three bedroom homes. Month-over-month, rents increased 1% for studio, one and two bedroom homes. In contrast, average rents for three bedroom apartments decreased by 1%. In February 2014, the borough-wide vacancy rate fell to 1.50% from January’s rate of 1.62%. The last time the Manhattan vacancy rate was this low was in September 2013, when the rate reached 1.48%. This is the second straight month of vacancy rate declines. The average Manhattan apartment rented for $3,417 during February 2014, $20 more than it did in January 2014, when the average was $3,397. Looking year-over-year, average rents are also up. The average apartment rented for $3,243 during February 2013, $174 less than it did last month. In February, 12% of rental transactions brokered by Citi Habitats offered a free month’s rent and/or payment of the broker fee to entice new tenants, compared to 13% in January. A year ago, in February 2013, the percentage of concessions was also lower, at 8%. While the percentage of leases with a landlord concession is the highest it’s been in two years, their use was most prevalent during the depth of the country’s economic downturn. The popularity of concessions peaked in December 2009, when a full 59% of leases included a move-in incentive. Click the image above to download a PDF of the full report which lists average rents by size and neighborhood. The rise of the jumbo-loan market has some lenders stepping up efforts to attract lawyers and doctors as borrowers. Busy professionals may have little time to cook, but many are still willing to pay top dollar for restaurant-worthy—and sleekly designed—kitchen appliances.